Congratulations to neighbor Miriam Herin. 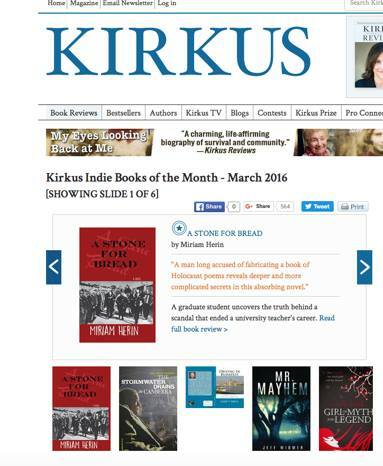 Her second novel, A Stone for Bread, heads the March “Indie Books of the Month” list in Kirkus Reviews. The bimonthly magazine reviews several thousand books a year and is widely read among booksellers and librarians. “Only an extreme select few books get selected by their editors for a featured review, and even fewer (literary greats) actually get a star,” author Michel Sauret wrote. Right — featured review and star. See example above. A Stone for Bread is available from Amazon and such fine local bookstores as Scuppernong Books on South Elm Street, an easy walk from College Hill. This entry was posted in Neighbors and tagged A Stone for Bread, Kirkus Reviews, Miriam Herrin, Scuppernong Books. Bookmark the permalink. Thank you for the wonderful and unsought endorsement of the novel. I’m incredibly appreciative not just for myself but for my publisher who has made an investment, as all publishers do, in this book.